Starring: Max Pomeranc, Joe Mantegna, Ben Kingsley, Laurence Fishburne, Joan Allen, William H. Macy, David Paymer, Michael Nirenberg, Robert Stephens, Hal Scardino, Dan Hedaya, Anthony Heald, Austin Pendleton, Tony Shalhoub, Laura Linney. Films that have their titles changed tend to be trying to market something else and normally raise alarm bells as to why the change was even neccessary. Where I come from, this is known as “Innocent Moves” (maybe because most people don’t know who Bobby Fischer is) but thankfully the film itself doesn’t suffer from this title change. 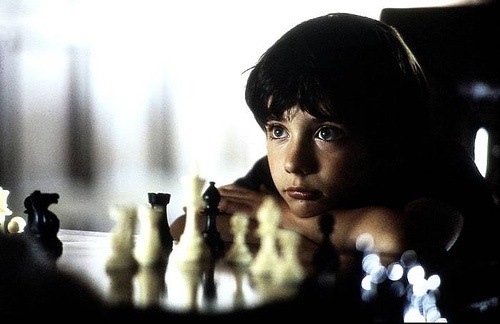 Sports writer Fred Waitzkin (Joe Mantegna) discovers that his 7 year old son Josh (Max Pomeranc) has a genius for chess, and enters him in competition, losing sight of what this does to the boy’s psyche – and his pure enjoyment of the game. Over the years we’ve had numerous films depicting the competitive nature in people. These have mainly been through sports films like Baseball, Football and most successfully Boxing. This time however, director Steven Zaillain uses the game of Chess as his triumph of the human spirit. What makes this all the more enjoyable though, is that it’s based on a real life story and Josh Waitzkin was a genuine chess genius at a very young age. 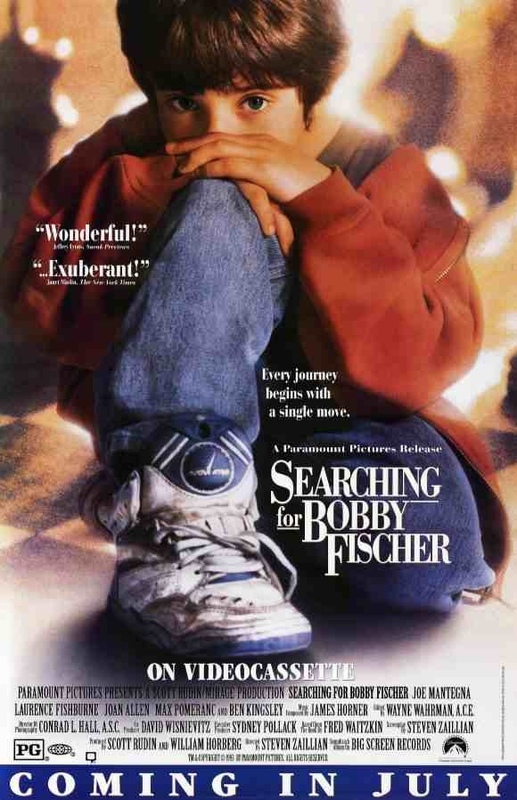 With him struggling to fulfill his own potential we are also given a running commentary on the career and odd disappearance of one time Chess champion Bobby Fischer. Zaillian handles the material sensitively and Max Pomeranc is absolutely superb as young Waitzkin. It’s a shame Pomeranc never furthered his acting career, as here he shows a maturity beyond his years and manages to be very expressive with just a glance and very few words. There’s also plenty of fine support by Joe Mantegna and Joan Allen as his loving and supportive parents and his two teachers Ben Kingsley and Laurence Fishburne are perfectly contrasted in their characters and different approaches to the game. The real star of the show though, is the game itself. Despite the often slow, ruminative appearance of a Chess game, it is in fact, a very exciting and thought provoking pastime. This excitement is perfectly captured by the late great cinematographer Conrad Hall, with close-up shots of the ebony and ivory pieces slamming onto the board. Chess has never looked so good and anyone with a great respect for the game – like myself – will find lots to enjoy here. Despite a few melodramatic and cliched moments, this is still an emotional and heartfelt drama, helped by an impressive ensemble of actors. A confident directorial debut by screenwriter Steven Zaillian. This entry was posted on January 29, 2012 at 7:23 pm and is filed under Drama with tags 1994. You can follow any responses to this entry through the RSS 2.0 feed. You can leave a response, or trackback from your own site. I thought this movie was a fantastic one. It portrayed someone as a boy who started to play chess. Playing with his dad to lessons to tourneys. A lot of people mimic that today. I did. Saw this earlier today, but didnt get a chance to comment. Nice review… I didnt really think there were any “melodramatic or cliched moments”. I thought it was a pretty low key film. Not too stereo typical or anything.